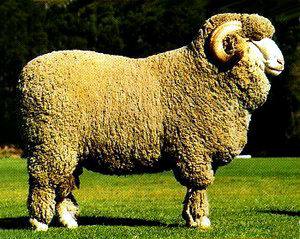 The Merino makes up numerically the largest sheep breed in South Africa with approximately 18 million country wide. Development of the breed started approximately 200 years ago and has been accelerated by the introduction of genetics from Australia. The South African Merino is plainer than the Australian Merino and fold development is moderate to suit South African conditions. Under extensive conditions ewes have a wool clip of 6-8kg (~13-18 lbs) and rams 9-12 kg (~20-26 lbs). These masses are considerably higher under ideal conditions. Average wool fibre diameter is 21.7 microns.